If you are looking for a holiday in the sun in perhaps the most beautiful area of Western Crete, in a luxury detached villa with Stunning sea views, a large pool shared with just 4 other villas, on the edge of Plaka, close to Almirida sandy beach then try Villa Emilia. Villa Emilia is fully licensed by the Greek Tourist Organisation EOT, licence Number 1042K92003266001 The Villa is very well equipped and clean with spacious kitchen, dining area, lounge, 2 bedrooms and 2 bathrooms. Outside, the private gated poolside patio surrounded by mature gardens is ideal for relaxing in private on sun beds or firing up the BBQ. All the grounds are enclosed and gated. Several terraces / patios offer shade or sun and various dining areas open and covered. Plaka village square is 5 mins walk, has a wonderful relaxed atmosphere and is renowned for its excellent tavernas and twisting backlanes abloom with bougainvilleas. There are a few café/bars and a minimarket. 5 mins drive down the hill in Almyrida are more shops, bakeries etc with tavernas, bars and fish restaurants lining the sandy beach front. Its perfectly situated overlooking souda bay in the Cretan village of Plaka with easy access to the blue flag beach in Almyrida. The villa has 2 bathrooms. The bathroom on the 1st floor has a bath, shower, wc and washbasin. The bathroom on the ground floor has a shower, wc and washbasin and it is also very convenient if you are outside by the pool. In addition to the air conditioning there are 2 free standing oil filled radiators for the cooler winter months. There are 2 pull out washing lines outside and also a collapseable airer in the storage area under the stairs. Free unlimited fast internet is available throughout the villa. Free unlimited wireless fast internet is available throughout the villa. The spacious living area has aircon ipod Dock, CD, Radio TV, DVD ,satellite, wifi router,leather settee and 3 seater sofa bed. There is a selection of books, games and DVDs for your use. Patio doors lead to a paved area where you can enjoy a barbeque. The oven is all electric with electric grill. A food welcome pack is proved including a bottle of wine to get you going on your arrival. A large selection of dishes, cooking utensils, pans etc is provided. An LCD tv, satellite, cd and dvd player are included. There is a large selection of both Fiction and non fiction books. There is also a selection of walking books, places to visit and a variety of maps. There is a selection of games and cards. Aprroximately 50 dvds are provided with choices for both children and adults. Both bedrooms have an adjoining balcony with stunning views over the Souda Bay. The balconies have chairs and tables for your comfort and are accessed via double patio doors in each bedroom. The pool is shared with 4 other villas but rarely tends to get busy. Notes on accommodation: This property has a Full EOT Licence (Ellinika Organisation for Tourism) and since 1st July 2010 it is illegal to rent a property without this licence, so you can rest assured we are legally registered and licenced renters and your holiday booking will be safe with no chance of us being closed down by the authorities A copy of the licence is on display in the villa. Air-conditioning (both hot and cold) is provided to both bedrooms and the downstairs living area and there is also an oil filled radiator for any chilly early or late season night. Both bedrooms also have ceiling fans. Solar heating provides hot water day or night and there is also an electrical immersion if required. Full fire equipment is provided on both floors. Linen, blankets and duvets are provided for both rooms so early and late bookings are provided for. Outside: The outside of Villa Emilia is a beautiful asset. It has a large garden and sun terrace making it ideal for all. Outside the furnished terraces and patios offer a choice of shade or sun throughout the day, steps from the upper patios lead down to the large secluded poolside Patio where sun beds, a sun parasol and a BBQ are provided. This area is surrounded by oleanders, fruit trees and colourful geraniums making it an ideal area for sunbathing and relaxing. Access to the 40sqm pool is a few steps away through a private gate and which therefore makes this villa a good choice for families with young children. A large table and chairs are provided on the covered downstairs patio and further table and chairs are provided on the sun terraces. Upstairs there are tables and chairs provided outside on the balconies where you can enjoy the glorious panoramic views over the sea and Souda Bay. This is a lovely place to watch the sunset and the boats come and go, you may even see a submarine. Cleaning / Towels / Linen / Maid service: Towels, linen and weekly maid service is included in the price. Please note beach towels for use round the pool or beach are not provided. The colourful mature gardens have fruit trees, and a variety of plants and flowers for your enjoyment. Other: The terraces and patios offer a choice of shade or sun, steps from the upper patios lead to the large private sun terrace with flowers,sun beds & BBQ.Access to the pool is a few steps away via a private gate making this villa an ideal choice for families. This was our second visit to Villa Emilia. The description is as it says. The villa is located a short walk from the local square. The Villa is situated in a lovely, peaceful area, with stunning gardens and lovely pool. The villa is comfortable, clean and suitable for all the family. Our first impressions of Villa Emilia were excellent. This lovely home contained everything we needed for a great stay. It was equipped to a very high standard. The outside furniture looked new, which was lovely for the lazy days when we did very little. It was comfy and clean and the welcome pack was very much appreciated. This villa has three super outside spaces and the pool and surrounding area was clean and safe. The gates to the villa would ensure safety for young children. Loads of pool toys, not that we used them! The washing machine was used a couple of times, as was the iron and ironing board, both looked fairly new (maybe just not used by other holiday makers!) We didn’t see the cleaners but they did a lovely job with our mid stay clean. The villa is perfectly situated for walks to Plaka village for the supermarket and tavernas. After lazy days and some evening meals in the village we walked home via “cardiac hill” - try it, you’ll know what I mean!! Short drive to a couple of local beaches or to eat slightly further away. Our favourite beach was Kalyves, nice eating places too. Being so hot, the bedroom fan and aircon made for a cooler nights sleep. All in all, one of the best villas we have stayed in. Would absolutely recommend it and wouldn’t hesitate to rebook. Two weeks wasn’t enough. Thank you Norman, Dawn and Team. A huge thank you to Dawn and Norman for our stay at Emilia. We really couldn't have wished for a more beautiful villa in such a wonderful area of Crete. The long relaxing days and nights mixed with adventures to Lake Kournas, Elafonissi, Kalyves and Georgioupolis (not to mention others) were an ideal way to spend out holiday. Plaka Square was always alive and friendly, definitely recommend Takis and Harokopas, the food is to die for!! All in all we cannot explain in enough words just how much we have enjoyed our stay at Villa Emilia, all we can say is that we will see you again 15th-25th September 2018. Thank you once again for so many great memories. Almirida is the nearest beach, just a few minutes drive or 15 minutes walk from Plaka Square and is a lovely village with golden sands and a small, pretty fishing harbour at the end of the beach. The beach has the blue flag award and the sea is shallow and shelves gently so is really safe for children and because the sea is shallow it warms quickly in the sun. The beach is lined with several excellent Tavernas and a fish restaurant where you can enjoy the excellent Cretan cuisine. 2 airports serve Crete and can be reached by car taxi or public transport. 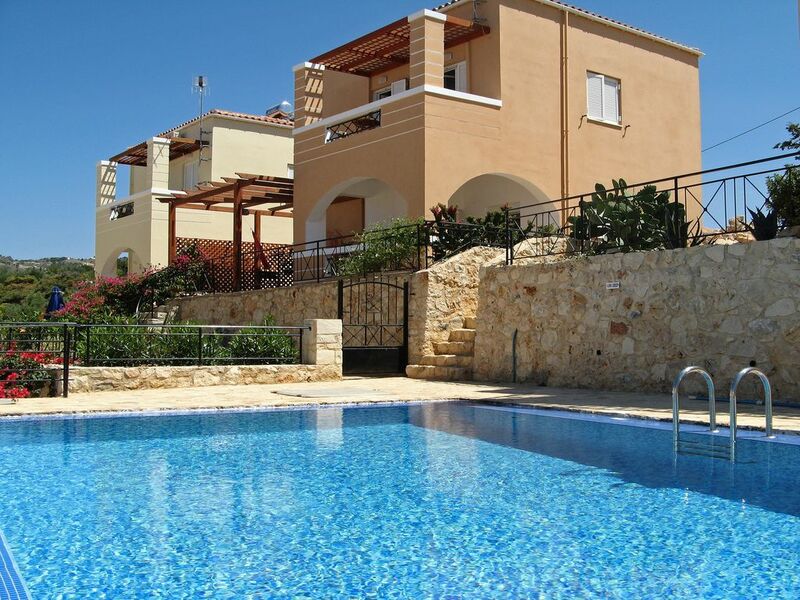 Chania - the nearest to Villa Emilia is around 23 Km easy drive with all instructions provided. HERAKLION - Further at about 130 Km but a very easy and pretty 1 1/2 to 2 hours costal drive right out of the airport onto the National Highway (dual carriageway) for nearly all the journey. Again full instructions are provided. Souda is the nearest Port at around 15km. Car recommended but not essential. Villa Emilia sits just inside the Village boundary in an excellent elevated position overlooking the pretty Plaka Village with its whitewashed narrow streets and its abundance of bougainvillea and geraniums and is 5 mins walk from the Villa. a few mins drive from Plaka. Visit and buy souvenirs at the glass blowing factory. Our guest book details all the places to visit. Villa Emilia has a perfect location making it an ideal holiday base for sun worshippers as well as walkers, and anyone wanting to explore this beautiful part of Western Crete. Situated overlooking the popular Cretan village of Plaka with stunning views of Souda Bay to the front of the villa and the White mountains to the south. The villa is 5 minutes walk to the village square where you will find a number of tavernas and bars as well as a couple of minimarkets. The nearest beach is the blue flag beach at Almirida, just 5 minutes drive from the villa (or 15 minutes on foot). Here there are watersports, numerous restaurants and car hire. The beautiful Venetian harbour town of Chania is approx 23kms to the west and is accessible by car or public transport, and Chania market is a must on Saturday mornings. There are many places to visit in the surrounding area such as the beach resort of Kalives, and the villages of Vamos, Gavalchori, Armeni, Kefalas etc. Details of places to visit including the waterpark at LIminopoluis are all provided in the detailed guest book in the villa, along with maps and local information. We found your villa to be of a very high standard and very well equipped and beds were comfy. We enjoyed all the views from split levels and the privacy from the garden with sunloungers. Many thanks for the welcome goodies, we had travelled for a long time with the children and to find many of the basics (plus wine ;) ) was a god-send. The plants and flowers are very pretty, the staff we saw were friendly and polite. We loved the BBQ and bought local meat which was lovely. The kids loved the pool and now can all swim! Many thanks again and hope to stay in your villa again soon. We had a lovely time. The villa was great and had everything we needed. It was in a great spot, amazing view and really reasonably priced. The instructions from the airport were perfect as well. Booking Notes: All prices are in UK pounds and include a free welcome pack of groceries/wine to get you going on your first day, all utility bills, weekly maid service, linen, towels, air-conditioning and use of safe and cot. A 25% deposit is required for booking and the balance to be paid 8 weeks prior to departure. Also at this time there is a refundable security bond payable of £100 to cover damages. loss of safe key and cost of telephone calls etc. Changeover Day: The preferred changeover day is Tuesday or Saturday but this can be flexible.